2017 Alfredo Maestro, Tinto Fino (Tempranillo) “Viña Almate” Peñafiel, Valladolid, VdT Castilla y León, Spain. Alfredo Maestro Tejero, a rebel winemaker who’s family came to Peñafiel, not far from Madrid in Valladolid, from the Basque Country, is now one of Spain’s most well known natural winemakers. After growing up with vines, it seemed always in the cards that Alfredo would become a winemaker and in 1998 he started making wines from local old vine vineyards, mostly neglected, but 100% organically farmed, and after self teaching himself to make wine traditionally, he converted to 100% natural in 2003, and in the cellar he adds zero to his wines, no additives whatsoever, including sulfur. The Viña Almate, named after the man himself (the first two letters of his three names) is his highest production wine, his regional cuvee is all hand crafted with whole-cluster fermentation with native yeasts in stainless steel with a 12-15 day maceration, then raised over winter in vat and bottled before the Spring, all unfined, unfiltered. This 100% Tinto Fino (Tempranillo) cuvée is made from fruit sourced from various plots in Valtiendas (Segovia), as well as in Peñafiel (Valladolid) from vines set on mainly clay-calcareous driven Alluvial soils of the region, coming from vines up to 80 years old at between 700 and 1,000 meters, that gives the wine its freshness and structure. 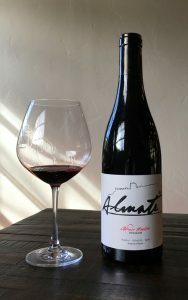 Alfredo’s 2017 Vina Almate is a deep ruby/garnet in color and while earthy and fresh has a dark sense violets and a ripe palate showing black cherry, plum and vine picked wild berry fruits that have a bramble and briar character with a light dusting of dried herbs and spices with hints of tobacco leaf, anise and grilled orange peel. This young Tempranillo is transparent and highly quaffable turning silken and a touch creamy with air, making it wonderfully enjoyable and fun in the glass, perfect for sipping and bistro dinning. Unlike the smoky inky Ribera del Douro or American oak marked old school Rioja, this is a naked version of this grape and it serves a clever natural niche with its purity and lightness of form, drink it up, not need to wait.